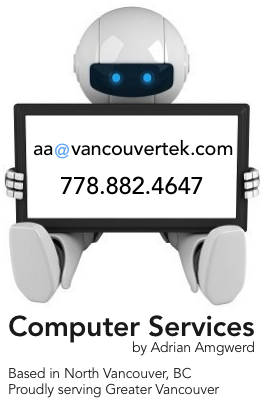 Computer services and support for residential and business customers in Greater Vancouver. On-site, Off-site and In-home Services. Pickup, delivery & drop off services are now available! Speedy services: Most requests completed in 24 hours! ECO / Environmentally Friendly Initiative. ~ Recycling + re-purposing computer hardware & parts. ~ Paper-free: invoices, receipts and communication. E+CO Consulting: Adrian Amgwerd provides our Vancouver office with PC installation, configuration, and maintenance requirements. Great Service! Highly recommended. iMap Multimedia Inc.: Excellent technical support and services! Honest, efficient and effective. We highly recommend Adrian! I.C. Autotek: Adrian provides our mechanic shop superb services catering to all of our IT requirements. Reliable all round great guy. SCM Risk Management Services Inc.: We have used Adrian Amgwerd on several occasions for business and personal computer purchases and repairs. Adrian has always been very efficient in getting the job done quickly and with very reasonable rates, he is always on time and quick to respond which is a great asset when you need your IT work done immediately! We highly recommend Adrian to anyone. Ocean West Financial Group: Adrian Amgwerd works with us to find unique customized solutions for our IT needs, and helps facilitate changes to our systems by working with staff to make sure they understand the transition. He always follows-up to make sure that our systems are working well for us, and to recommend quality improvements where we need them. 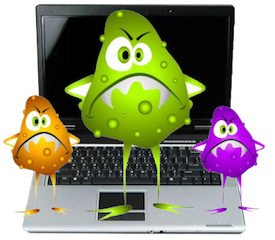 Not only that, he is very friendly and has a good sense of humour – which goes a long way when dealing with computer and IT issues! Josh Hinkson Photography: Over the years Adrian has consistently provided top-notch computer servicing. He's incredibly efficient, reliable and resourceful. Adrian’s vast knowledge allows him to solve any computer issue whether you own PC or Mac. There is nobody else that I recommend to friends, family or strangers alike! Vantage Painting: Adrian has provided us with all our computer diagnostic, networking, repair and purchase needs for years. We have never had a computer issue Adrian was unable to repair even on very short notice. He is fast, efficient and diligent, often completing the work same night or the next day. Whenever we purchase new computers, Adrian is always there to provide great advice and to help us select the best equipment to fit our budget and needs. Great service & very reasonable rates! Unlike many other technicians, we have complete trust in Adrian to provide only the necessary work without any hidden costs. We have and always will use VancouverTek for all hardware, software and computer repair needs.